THE LAB determined that an Ambrell EKOHEAT 15 kW/50-150 kHz induction heating system would be optimal for this application. A specially designed single position multiple-turn helical coil was leveraged. Testing showed that heating to the targeted through-Curie temperature would take two minutes and twenty seconds. The client benefitted from speed gains with this induction heating process along with greater safety and enhanced repeatability. And thanks to the expertise from THE LAB, the client knew exactly how induction would work with their application prior to making a system purchase. 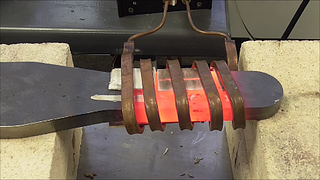 Interested in learning about other forming/forging induction heating applications? Check out our application library and see how others have benefitted from the expertise of Ambrell's applications experts.